Today I’ll be filling in for Cody on his blog since I couldn’t find time for one if I tried and he has been gracious enough to let me post when topics come up. My name is Drew Tonnesen (@drewtonnesen) and I’m a systems engineer in the ESD organization at EMC (basically the engineering side of the house). 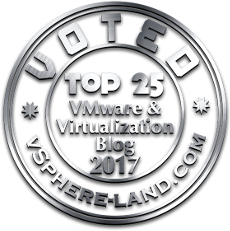 I work on the integration of virtualization technologies (mostly VMware) with the Symmetrix platform but also focus on VPLEX and RecoverPoint. Cody and I have worked together for many years now and though we get moved around a bit and re-organized, we both continue to work on VMware/Symmetrix integration like our TechBook (yes, shameless plug: http://www.emc.com/collateral/hardware/solution-overview/h2529-vmware-esx-svr-w-symmetrix-wp-ldv.pdf). This paper covers the integration of a VPLEX Metro with Oracle Applications, Oracle Extended RAC, RecoverPoint and VMware SRM for DR. It goes through the configuration of both VPLEX and RecoverPoint and the implementation of RAC and Oracle Apps on that environment. I also include the integration of FAST VP, VASA and most important Virtual Storage Integrator (VSI) including the new RecoverPoint Management feature which can be downloaded here: https://download.emc.com/downloads/DL48087_VSI-RecoverPoint-Management-5.5.zip. I’m going to cover one component of that paper in this blog, doing point-in-time test recovery with VSI RM and RP. 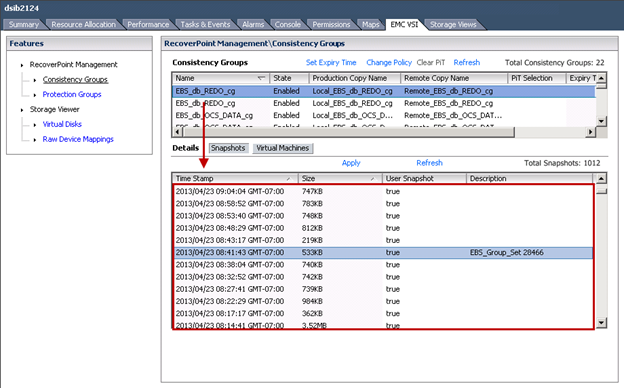 As Cody mentioned on 6.20.13 in his posting “Point-in-time test recovery with SRDF and VMware SRM”, RecoverPoint 4.0 (RP) in conjunction with the VSI feature RecoverPoint Management (VSI RM), has the ability to run a test recovery in SRM using a PiT copy. Now that VSI RM is available, I thought it might be useful to show how to run a test failover with a RP PiT using VSI RM. Fortunately, the procedure to accomplish this is more straightforward than that explained by Cody for SRDF, as VSI RM was created solely for this purpose. In addition, VSI RM will permit the use of a PiT copy for disaster recovery beginning with the newly released patch, P1, for RP. 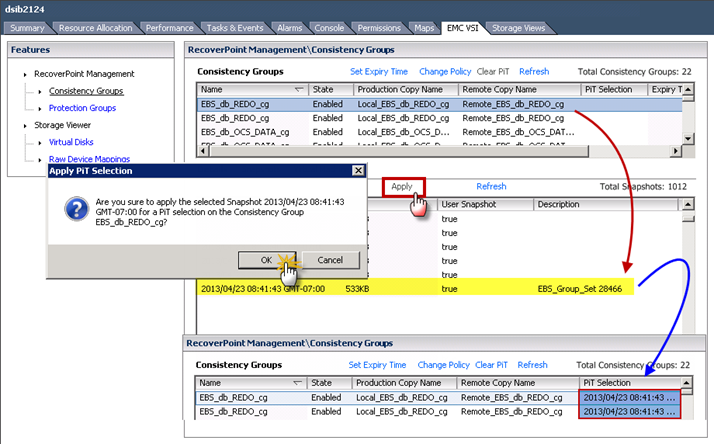 First, what is the RecoverPoint Management feature of VSI 5.5? It is an enhancement to VSI that allows the user to select Point-in-Time (PiT) copies for use in VMware SRM failover testing or disaster recovery scenarios when used in conjunction with RecoverPoint 4.0. 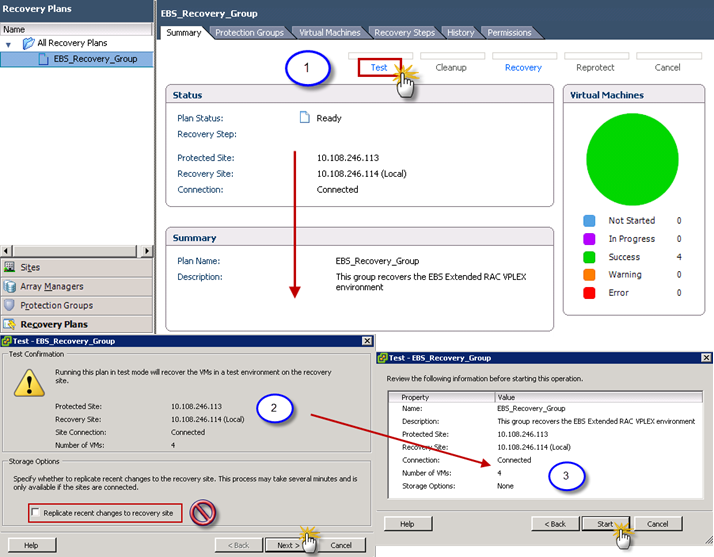 The RecoverPoint Management (RM) 5.5 feature is accessed and run from within VSI. It is not intended to replace the RecoverPoint GUI console in any way as it is only used in conjunction with Site Recovery Manager. In fact, the use of the feature is only possible if RecoverPoint is previously configured to allow VMware SRM to manage the environment for the purpose of image access. With the entries in place VSI will be able to discover information about the RecoverPoint environment, such as consistency groups and bookmarks, which will permit the setting of a point-in-time (PiT) for a consistency group. When executing a recovery plan for VMware SRM with RecoverPoint, by default the latest consistent image across the consistency groups in the protection group will be used whether VSI RM is in use or not. For many customers this might be acceptable, but for others they will want the capability that the VSI RecoverPoint Management feature provides which is PiT selection. 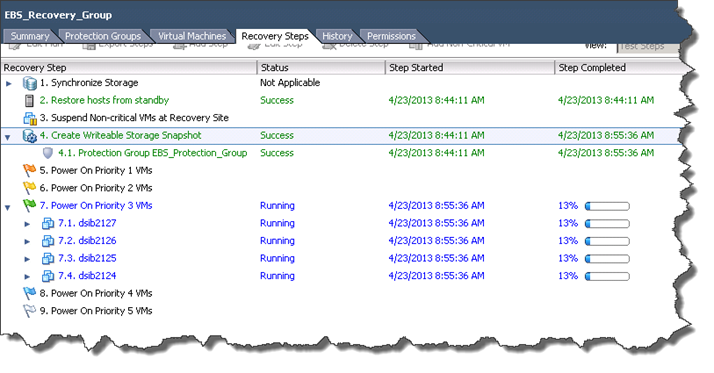 With VSI RM a PiT image can be applied to the RP consistency groups that make up the VMware SRM Protection Group. Setting the PiT is done on the production (protected) site at the VM level. 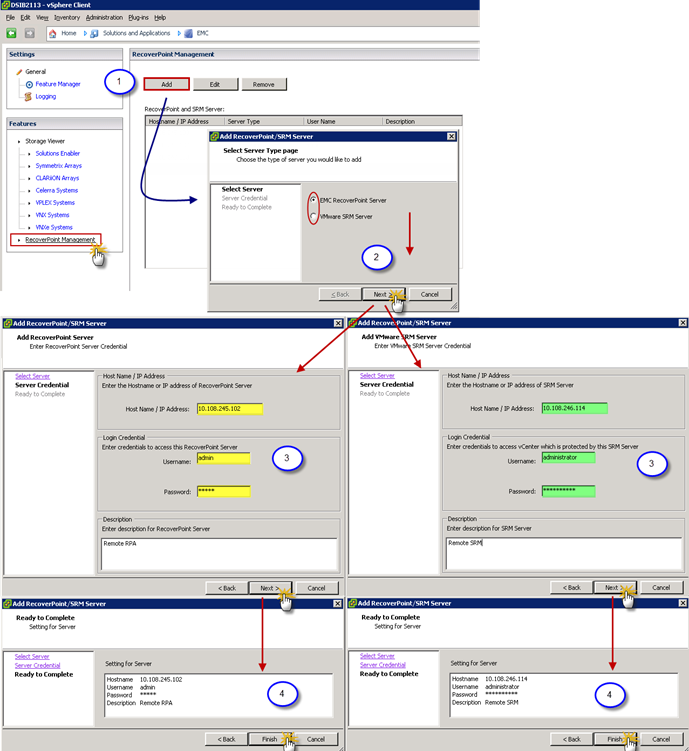 The picture below shows all the bookmarks for consistency group EBS_db_REDO_cg when a VM in the protection group is chosen. In the picture below is the detail how a PiT is applied instead of using the current image. It is only necessary to apply the PiT to one entry for each consistency group. Note that you must apply a PiT to every consistency group involved in the protection group. There is an easy way to check that this has been done correctly. In VSI there is a secondary view called “Protection Groups” where all the consistency groups related to the group are shown. The screenshot is after all PiTs have been applied. The user can also set an “Expiry Time” on the image so that it will not be used after a certain date. It is recommended that the expire time be the same for all consistency groups involved in the SRM testing. If no expire time is applied, the PiT will be used any time a SRM test failover is conducted assuming the PiT is not manually changed. With the PiT set, start a failover test. 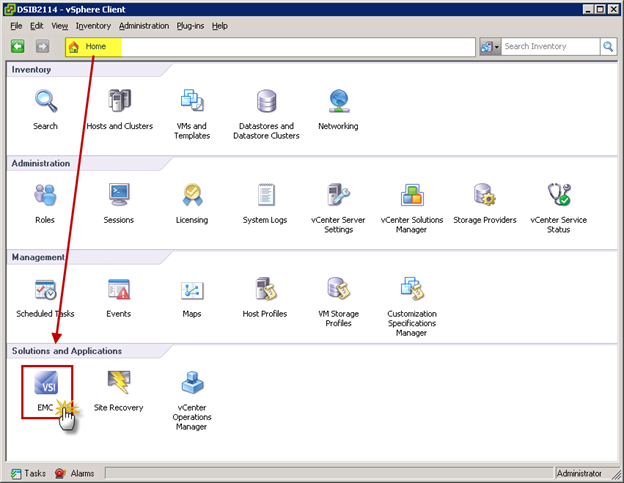 On the remote vCenter navigate to the Site Recovery icon from the home page of vCenter. Login to the site then select the recovery plan. At this point the test can be run. In the screen below it demonstrates the three steps to execute. First select “Test” from the options in the panel. When the second dialog box comes up, uncheck the box to replicate recent changes. This box is irrelevant to the RecoverPoint SRA but if it is left checked then SRM does some extra testing adding time to the failover test. Select “Next” then “Start” to begin the failover test. While the test is running, the status of the RecoverPoint consistency groups on the remote site can be monitored to see when image access is enabled at the chosen PiT. The picture below shows the transformation from one state to the other. Shortly after the power-on of the virtual machines, the test finishes successfully. With that, the PiT image is available for whatever activity the business requires. 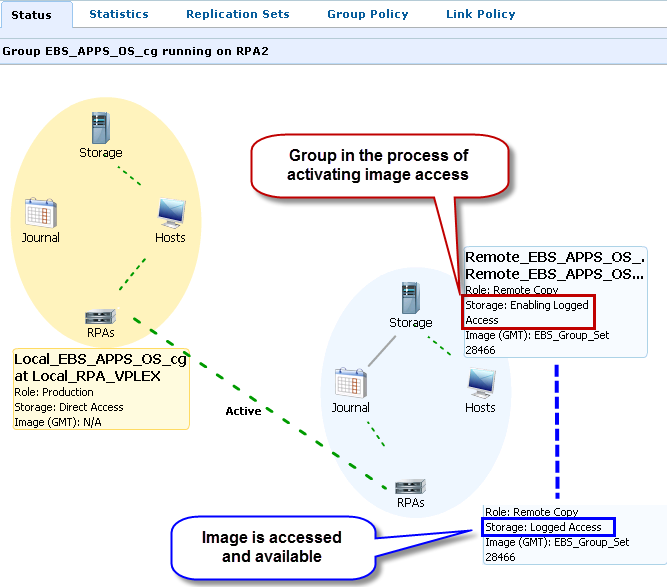 For a more thorough look at RecoverPoint PiT in an Oracle Extended RAC VPLEX environment, including how to use it in a DR scenario, again, please see my whitepaper: http://www.emc.com/collateral/white-papers/h11767-vmware-vplex-rp-srm-wp.pdf. Great article. Thank you very much from sharing. we have Recoverpoint 4.0 and CG’s are managed by Vmware SRM. Is it possible to do the DR test using SRM when the network is between the sites primary DR sites is taken offline. I could not find any documentation that mentions DR test without network between the sites. all i see is fail-over options for srm. we want to do test DR. He copied this post that he wrote here to his own blog when he started it. He was the original author for this post.